British prime minister Winston Churchill took a different view. Churchill believed a partitioning of Germany was necessary – but not to the extent proposed by Roosevelt. This, Churchill believed, would fill western Europe with small, economically fragile nation-states. Churchill preferred the creation of three German-speaking states in the north, south and west. These states would be resourced enough to be prosperous but small enough to be supervised and managed, particularly if they attempted rearmament or reunification. Another proposal, the Morgenthau Plan, also appeared in 1944. 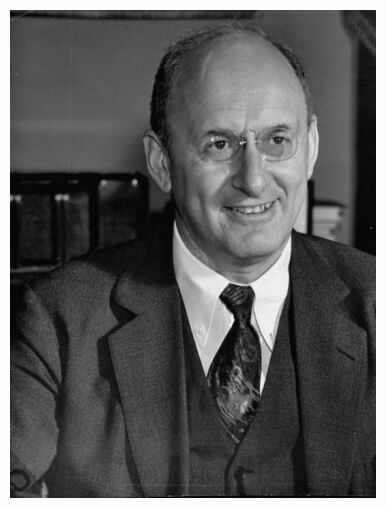 Named for its inventor, US Secretary of the Treasury Henry Morgenthau, this proposal called for the dismemberment of the German state and the almost complete deindustrialisation of the German economy. Terrorities on Germany’s fringes would be given to the Soviet Union, Poland and France, while the Ruhr (a crucial industrial region) would remain under international control. The remainder of Germany would be divided into two separate nations. Roosevelt gave his approval to the Morgenthau Plan. 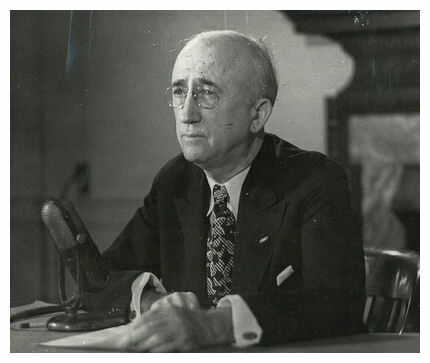 It was never implemented due to Roosevelt’s death in April 1945, however, Morgenthau’s proposals did have some influence on Allied policy with regard to post-war Germany. The Soviet Red Army crossed the German border in January 1945, while the US Army entered western Germany in March. As per the London Protocol, signed in September 1944, the Allied armies moved to occupy discrete sectors. The Soviets (north-east), British (north-west) and Americans (south) each occupied approximately one-third of German territory, while the French controlled smaller zones along their border. The German government was replaced by the Allied Control Council, a four-nation body formed in August 1945. This Council oversaw the transformation of post-war Germany, issuing directives on a range of matters including the rules of military occupation, the demobilisation of the German military, the ‘de-Nazification’ of German life and a process for dealing with war criminals. The Allied Control Council was plagued with differences of opinion and internal tensions, however, and within a year the Council had broken down. By late 1946, the four Allied powers were administering their occupied zones fairly autonomously. Like Byrnes, Truman accepted that a unified, industrialised Germany was essential for European recovery. In mid-1946, US and British representatives began planning a merger of their occupation zones into a single economic unit. They invited the French and Soviet zones to join this merger but both resisted. In January 1947, the American and British zones combined to form ‘Bizonia’. Six months later, Truman ordered the suspension of further reparations exports from Germany, declaring that an “orderly, prosperous Europe requires the economic contributions of a stable and productive Germany”. He lobbied the British to permit increases in steel production in Bizonia, from 7.5 million tons to 10.7 million tons. The Americans allowed Germans to take the first steps towards a return to self-government, establishing a number of local boards to manage food and agriculture, transport, communications, finance and trade. This contrasted with the Russian zone, where the process of ‘Sovietisation’ was well underway. German communists and social democrats formed a coalition under pressure from Moscow. This left-wing coalition dominated local and regional elections in 1956. By 1948 it was effectively in control of the zone, albeit as a puppet of the Kremlin. In April 1949 Bizonia became Trizonia when the French agreed to a merger with their occupied zone. Weeks later, Trizonia became an independent state: the Federal Republic of Germany, more commonly known as West Germany. In October, the former Soviet zone declared itself the German Democratic Republic or East Germany. 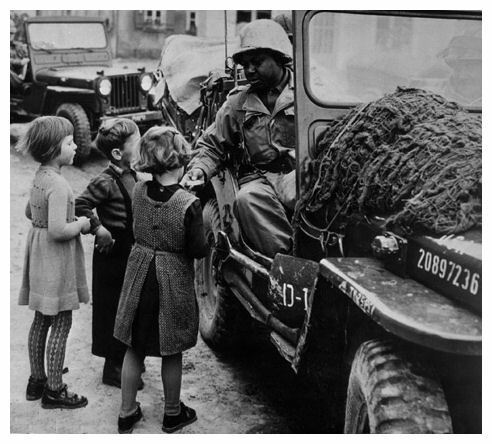 Over the next four decades, the two Germanys were a focal point of world attention. Many of the Cold War’s most iconic events or symbols – the Berlin Wall, ‘Checkpoint Charlie’, the Brandenburg Gate, John F. Kennedy‘s “Ich bin eine Berliner” speech and Ronald Reagan‘s challenge to “Tear down this wall” – all happened in Germany. The divisions and tensions between communist East Germany and the US-sponsored West Germany became both the epicentre and a microcosm of the broader Cold War. 1. A pressing concern for the Allies was how to manage Germany after World War II. Some leaders favoured breaking Germany up into many smaller nation-states, while others preferred a two- or three-part division. 2. The Morgenthau Plan, formed in 1944, suggested that the four Allied powers occupy Germany in separate zones. They would work to demilitarise and deindustrialise Germany to prevent any chance of another war. 3. 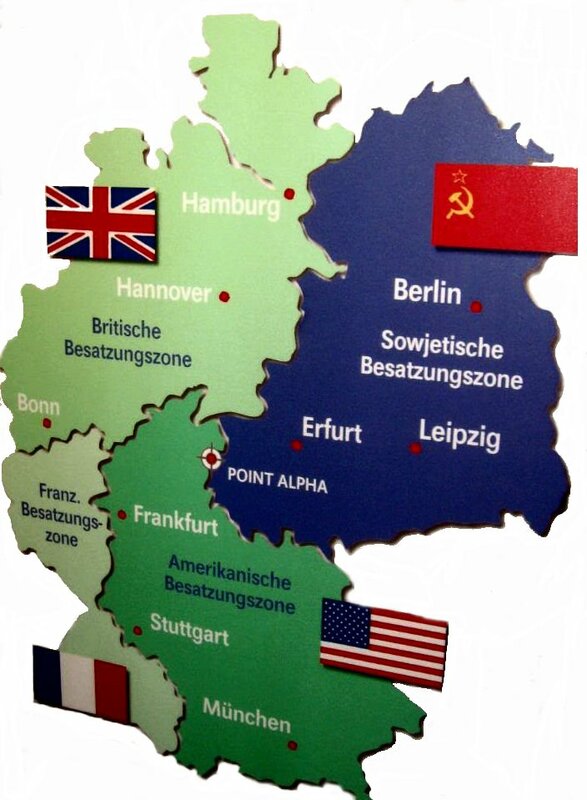 Germany was indeed occupied by the Americans, Soviets, British and French in four discrete zones. By 1946, however, the Americans preferred that Germany remain a single, independent nation. 4. Consequently, the Americans allowed a degree of economic and industrial recovery in their sector. Meanwhile, ‘Sovietisation’ led to the rise of a Moscow-backed socialist government in eastern Germany. 5. In 1949 the American, British and French zones merged to form a unified nation: the Federal Republic of Germany, or West Germany. The Soviet zone became a socialist nation: the German Democratic Republic, or East Germany. J. Llewellyn et al, “Post-war Germany”, Alpha History, accessed [today’s date], https://alphahistory.com/coldwar/post-war-germany/. Alpha History’s Cold War site contains 337,049 words in 404 pages. This site was updated last on March 6th 2019.